Vicky Tiel 21 Bonaparte Body Cream 6.7 fl. oz. Vicky Tiel Pour L' Amour Body Cream 6.7 fl. oz. Vicky Tiel 21 Bonaparte 1964 Body Cream 6.7 fl. oz. 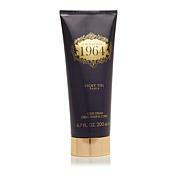 Vicky Tiel Femme Absolue Body Cream in Tube - 6.7 fl. oz. A rich body cream that deliciously perfumes the skin with the irresistible essence of the 21 Bonaparte Fragrance. Ingredients: WATER (AQUA), ISOPROPYL MYRISTATE, FRAGRANCE (PARFUM), GLYCERYL STEARATE, CETYL ALCOHOL, PHENOXYETHANOL, SORBITAN TRISTEARATE, CARBOMER, CAPRYLYL GLYCOL, SODIUM HYDROXIDE, ALOE BARBADENSIS LEAF JUICE, DISODIUM EDTA, BENZYL SALICYLATE, LIMONENE, ALPHA-ISOMETHYL IONONE, LINALOOL.